Carbon Filtration is a method of filtering that uses carbon to remove chemicals (such as chlorine, volatile organics and others) and some bad tastes and odors from water. Activated carbon is a form of carbon processed to have small, low-volume pores that increase the surface area available for adsorption. Catalytic carbon is a specialized carbon media effective in removing Chloramines from the water, a compound of chlorine and ammonia increasingly being used in place of chlorine as secondary disinfection in public water supplies. 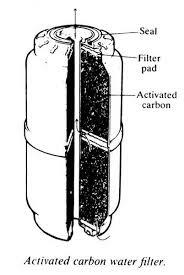 With the carbon filtration process, water passes through activated carbon, which is porous, trapping certain particles that are attracted to the porous material in a process known as adsorption. At some point, adsorption capacity is exceeded and the filter must be changed in order to be effective. Coal is the most common element used to produce carbon filters, but manufacturers will often enhance carbon filters by using other elements and blends of materials such as coconut shell and other materials. These materials are “baked” at extremely high temperatures creating very large numbers of pores within the materials, giving them large capacities for the adsorption process. This “baking” is the “activation” process that makes these materials so effective at removing certain impurities from the water. Effectiveness really depends on what the filter is designed to achieve in filtering out waterborne particles. 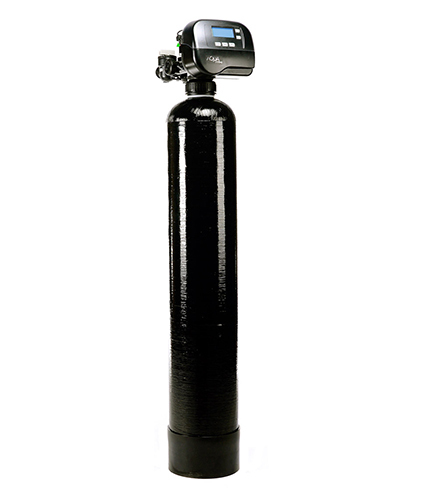 Carbon filters vary in size, design, function, efficiency and life cycle and different activated carbon filters are designed to allow a certain flow rate of water through the filtering process as well. According to EPA (the Environmental Protection Agency in the United States) Activated Carbon is the only filter recommended to remove all 32 identified organic contaminants including Trihalomethanes (THMs – by-products from chlorine). The same is true for all 14 listed pesticides and 12 herbicides. Carbon filtration is also effective at removing a variety of odors and bad tastes from the water. Carbon filter effectiveness is measured in terms of size of particles they can attract. I.e. 1 micron, 5 micron, 10 micron, etc. A water treatment professional can determine the most appropriate micron rating for your application. Nominal Filter rating – a filter that will remove 85% of the particles of a specified size (in microns) and larger. A filter with a nominal rating at 1 micron will remove 85% of particles that are 1 micron or larger. Absolute Filter rating – a filter that will remove 99.9% of particles of a specified size (in microns) and larger. An absolute rated filter at 1 micron will remove virtually all particles 1 micron or larger. Carbon filtration can help remove harmful chemicals from your water and H2O Care can install a whole house water filter, an under-counter water filter or any other solution that will solve your specific situation. Give us a call at (800) 539-1100 or contact us here.